In this issue we report on an advance in breast reconstruction after cancer surgery—one that puts patients in charge of their progress, allowing them to increase the size of their implants with a remote control device from the comforts of their home. 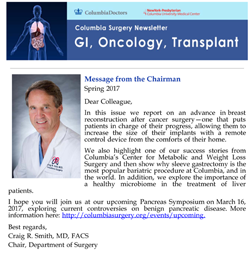 We also highlight one of our success stories from Columbia's Center for Metabolic and Weight Loss Surgery and then show why sleeve gastrectomy is the most popular bariatric procedure at Columbia, and in the world. In addition, we explore the importance of a healthy microbiome in the treatment of liver patients. I hope you will join us at our upcoming Pancreas Symposium on March 16, 2017, exploring current controversies on benign pancreatic disease. More information here.